Veilleurs Dans La Nuit ("Watchmen of the night") is a film showing a day in the life of the Abbaye Sainte-Madeleine du Barroux from Matins at 3.30am to compline at 7.45pm. 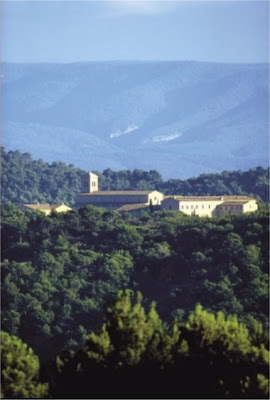 There are many vids, clips and photos around of lovely monasteries, glorious chant, and atmospheric photos of the consecration. "Veilleurs Dans La Nuit" has all these in abundance but also offers simple but outstandingly effective teaching on the monastic life in particular, much of it applicable to the Christian life in general. et non confundas me ab expectatione mea. "What he sings then is a commitment for his entire future. Man's greatness and nobility lies in his being able to pledge himself by a word, to direct his whole life in an instant." This optimistic and confident understanding of the nature of man could also be applied to the vows of marriage. There are scenes from the bakery, the smithy, the library and the fields, including some glorious views of the surrounding countryside from the weekly walk. The clothing of a new novice is shown by a young man who is divested of his military uniform and clothed with his new habit, recently cut for him by one of his new brothers. 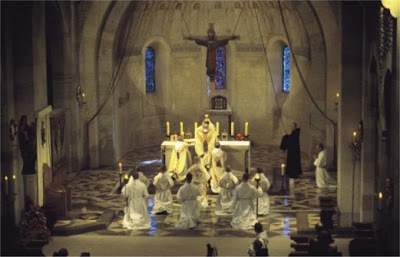 The Abbot, Dom Louis Marie, explains that the Church is set aside for prayer: "Nothing else may be done there." "We don't serve a purpose. We serve someone. We serve God." Thinking of the European elections in which we must vote on Thursday, the dreadful waste of money and institutionalised gravy train that makes our own recent sleaze look modest by comparison, it is amusing to ponder the monks building Europe as a side-effect of their life "hidden with Christ in God" and tragic to think of the enormous resources put into secularising it. I am very grateful to Dom Edumund for kindly sending me a copy of this inspiring DVD. I warmly recommend getting a copy for yourself. You can order the DVD here. At the bottom of the page is a link for help in English when ordering it. src="http://www.gloria.tv/?media=27877&embed" type="application/x-shockwave-flash" width="400" height="248" quality="high" scale="noborder" allowscriptaccess="always" allowfullscreen="true"
Fr Z also has a number of screen grabs in his post on the stunning DVD.